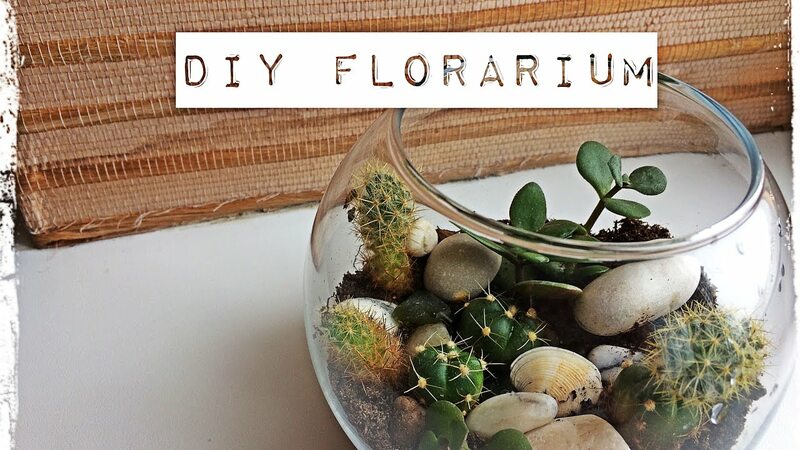 Florarium or terrarium plant – a small home greenhouse, transparent container made of glass or plastic, in which the plants grow. Dry air in the winter season, the lack of light, cold on the windowsill of the window glass and the lack of time for regular care often put an end to the dream of owning a tropical garden with moisture-loving and thermophilic species. It florarium – perfect for those who love exotic plants, but climate normal city apartments do not have their breeding. As a rule, florarium made of glass or a transparent plastic, dense, and have a fully wooden model or combined with transparent inserts. In contrast to the terrarium, florarium necessarily narrowed inlet from above or from the side to ensure that the microclimate inside the container. Often this hole is completely closed by a cover. 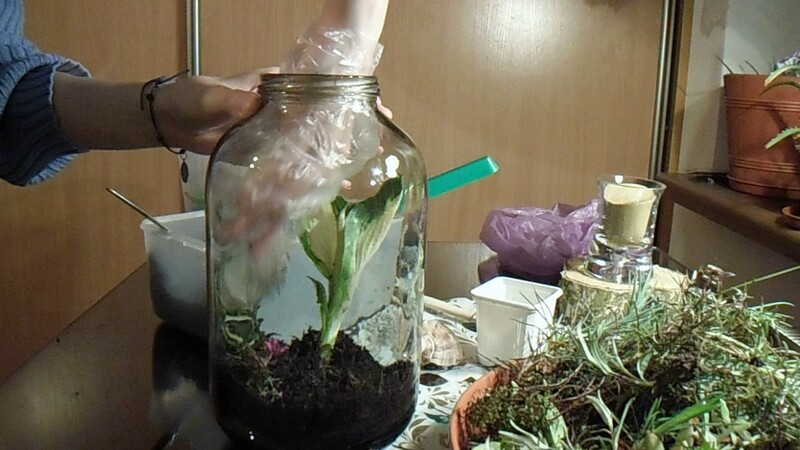 Used special containers for growing plants, as well as all kinds of glass bottles, jars with lids, a large bottle of wine, a bowl with a narrowed opening, laboratory flask. The main purpose is to maintain florariuma more or less stable level of humidity and temperature in the greenhouse. Special equipment for heating and lighting can make florarium independent source of natural light and heat. All this allows us to grow in the container most whimsical plants that require certain conditions and care. if florarium completely closed, it is necessary to air it regularly, to the walls of the condensate does not accumulate. 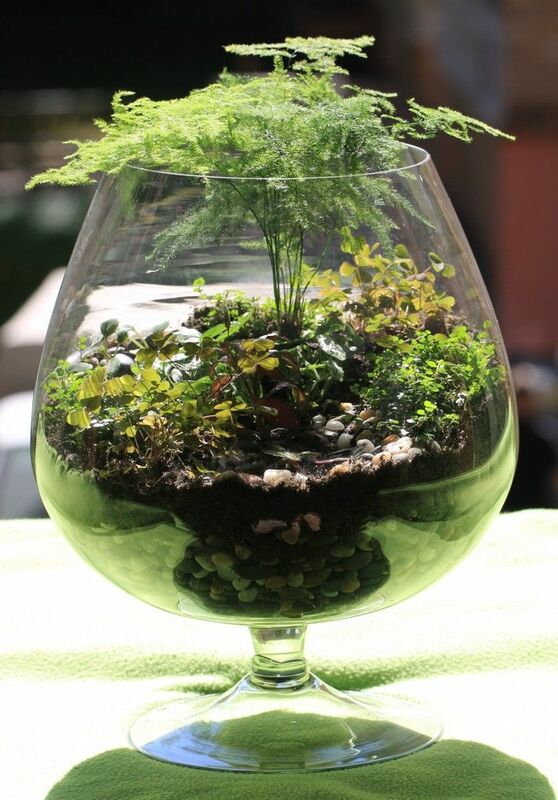 For plant terrariums using rectangular aquariums, terrariums for turtles, snakes and other animals, large round vases, bowls, even ordinary glass cups or glasses. This option is called florariumom-showcase. Access to the plant is open at the top, and therefore, it is necessary to strictly observe the temperature regime, regularly watered and sprayed, avoid drafts, if necessary plants. Another important advantage florariumov is their compactness, which is especially important for owners of small apartments and small sills, which do not have space for large pots. 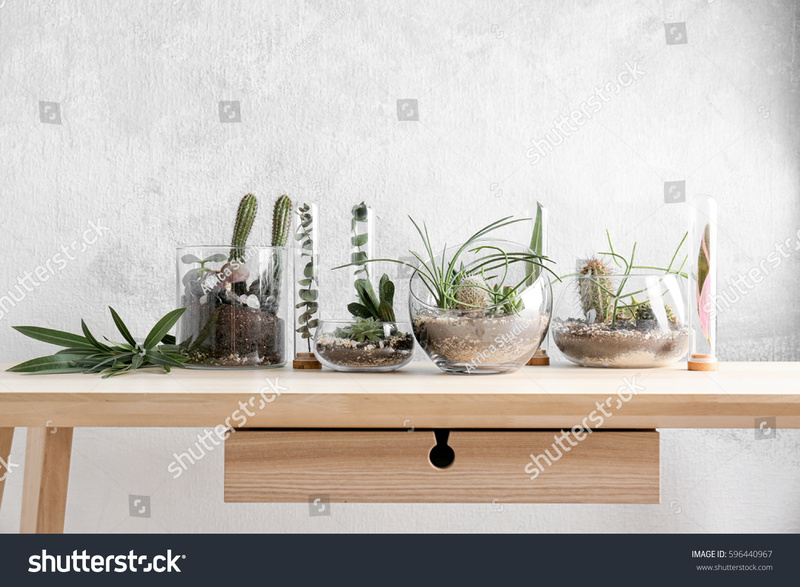 A variety of herbal compositions in the terrarium look very stylish and extraordinary, especially in comparison with the standard pots with plants. It is worth remembering that no matter how slowly the plants do not grow, sooner or later they would be crowded in a small tank. Then the flowers can be transplanted into pots and fill florarium new composition. 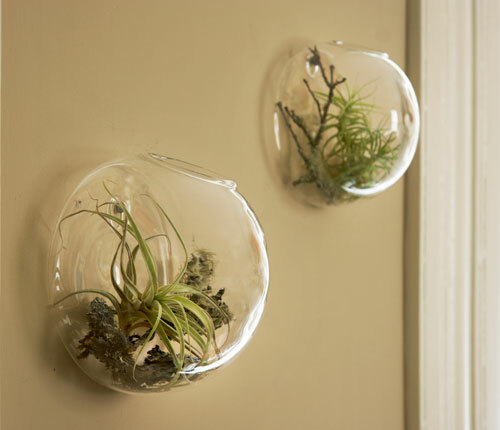 Florarium essentially mimics the natural habitat of the selected plant. 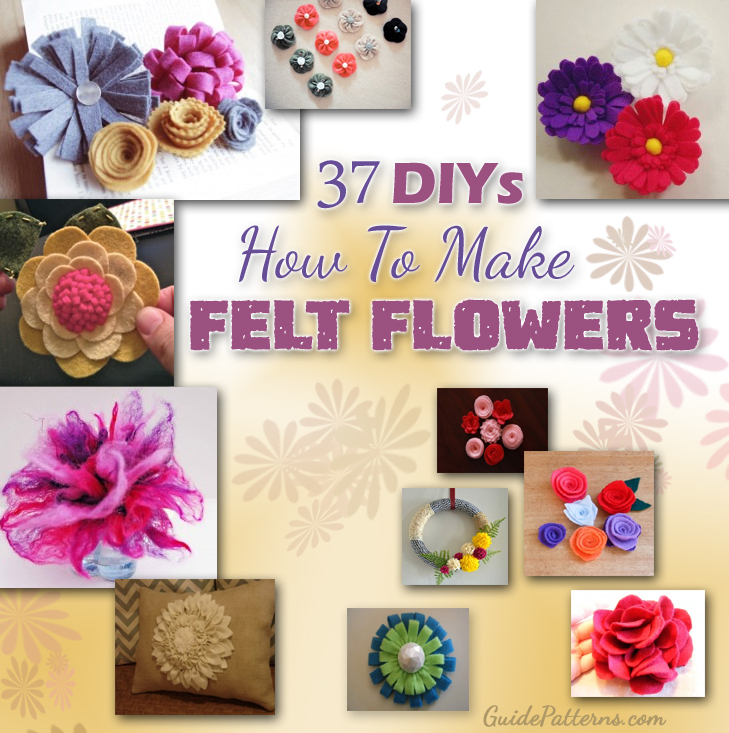 Therefore florarium create with their hands should be based on the climatic zone and habitat. Do not put in a terrarium rainforest ferns and succulents from the desert. For each type of florariuma need your watering regime, ventilation and temperature, so that the whole plant composition is not lost. 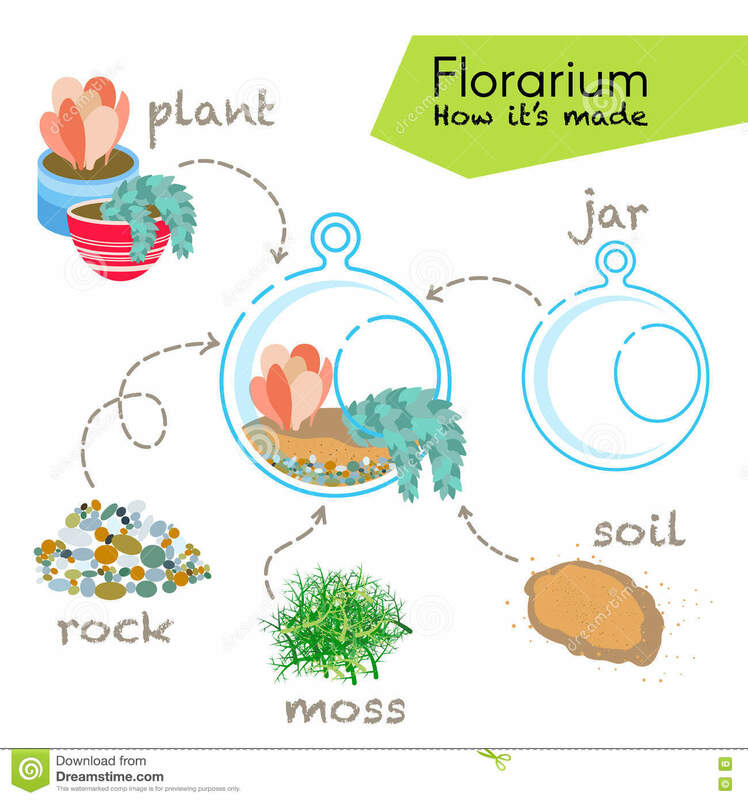 Let’s look at three main types of florarium. 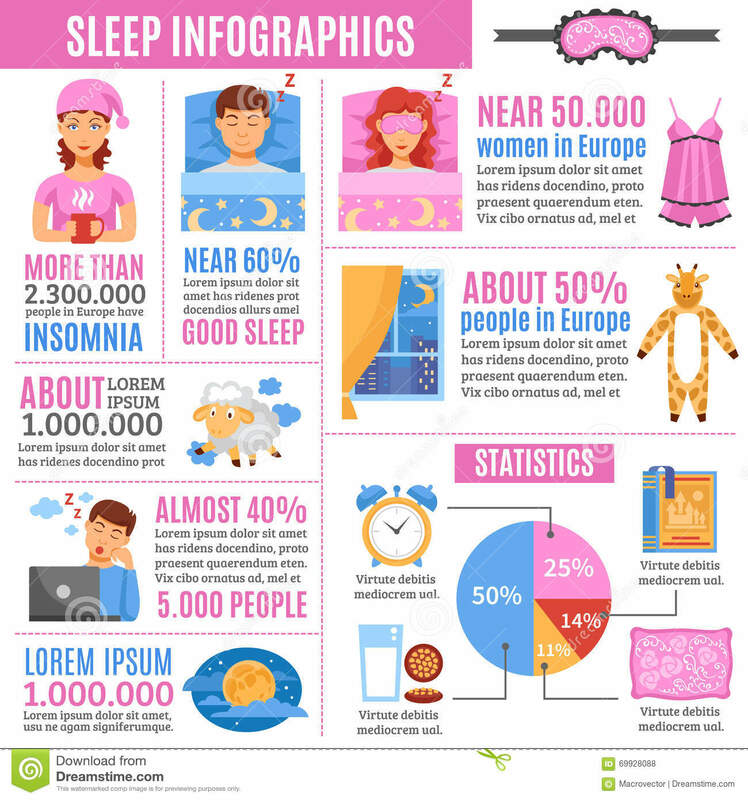 The basis of the compositions come from tropical rainforest with a huge variety of plants, such as the Amazon rain forests, moist forests of Southeast Asia, the Atlantic Equatorial coastal forests. Even in a small container, you can recreate the likeness of multi-storey forest jungle, using plants of different heights. It is important that the foreground of the composition remained open, giving the opportunity to see all the tiers. Although rainforest image created, mainly visually, using plants which can be freely available in flower shops. It is not necessary to look for rare tropical species. The main condition for the selection of plants the composition is similar requirements to soil, moderate growth, and the need for high relative humidity. The soil is preferred to use a complex composition, with an admixture of coarse sand, leaf soil, peat. To maintain high humidity can be installed in a vessel with a small cup of water and decorate it, put a little snag out of water. Plants: ivy, asparagus, dwarf ficus, sweet flag, begonias, miniature ferns, Crotone Fiton, chamaedorea, Selaginella, some species of bamboo with a moderate rise. Care. Care compositions with plants Wet Tropics largely boils down to keeping the container optimal humidity and temperature. The humidity level of 70-85%, the temperature is at least 25 ° C, frequent watering and spraying in dry air conditions, apartment or using an open terrarium. 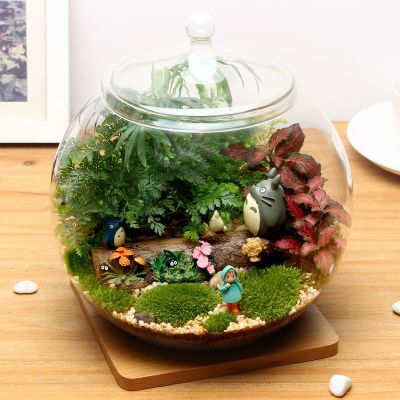 If you have neither the time nor the inclination to monitor the humidity in the terrarium, frequently watered and feed the soil, it does not matter, there are plants, which did not need thorough care. We are talking about the inhabitants of deserts and semi – group of plants under the name succulents. Although it is believed that florariumy only suitable for tropical plants, succulents feel in containers as well. For them, just convenient to use open terrariums and narrowed blood vessels without neck. 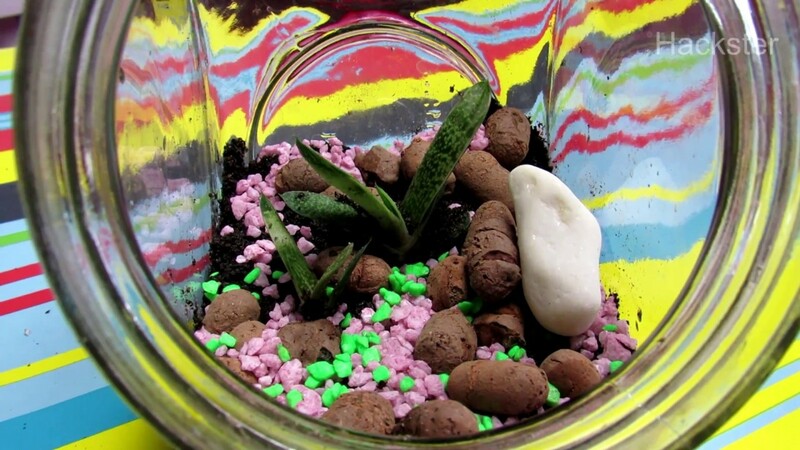 The soil can be formed from a large and finely sifted sand, put a few stones, decorate ceramic fragments. 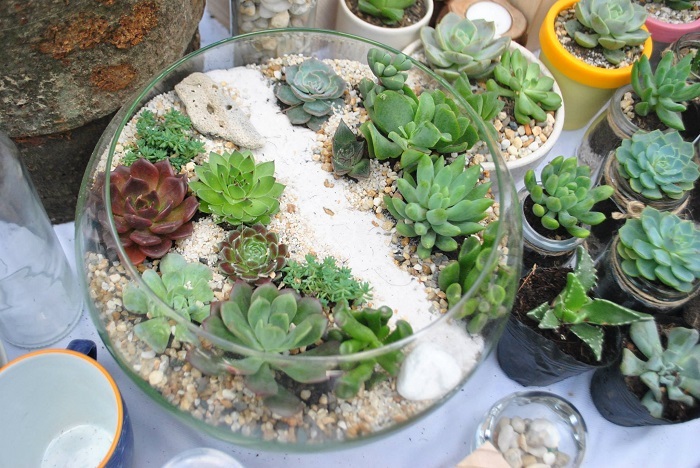 Plants: various succulents original form – young, agave, adromiskus, borodnik, the green, dikiya, kalanchoe, malefora, spurge, Euphorbia, different species of cactus. Care: Watering must be done as the soil dries. In a period of growth, from spring to autumn rather than once a week – one and a half, and in the winter – once in three or four weeks. If you went on vacation for a few weeks – do not worry, the plant will meet you in the same perfect form. Succulents prefer to moderate the room temperature, in the winter, even cool – 13-15 ° C. Looking for the sun’s rays, therefore, fully justified the placing on the windowsills. 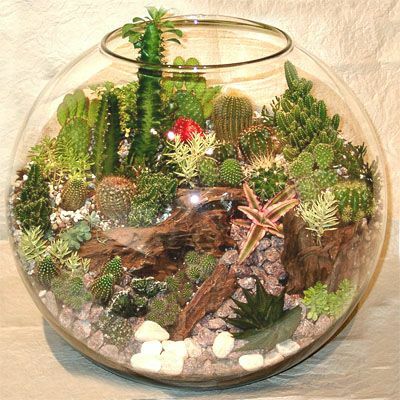 Mountain plants in plant terrariums can be divided into two types: the inhabitants of the mountainous rocky, semi-desert plateau and the foothills of the forest plants, including tropical rainforests. Therefore plant assortment for florariuma with mountain landscape as a whole is the same as for the other two species. Dry mountain areas are characterized by semi-desert plants, and for the wooded mountains – the inhabitants of the rainforest. For rocky areas are specific representatives Gesneriaceae – Saintpaulia, as well as some vines. Again, depending on the selected direction, the soil should be fat, saturated organic matter and good drainage or desert, with large pebbles. Actively use the large stones of irregular shape, with sharp edges and chipped, which will mimic the rocky ridges and peaks. Rasteniya: ferns, ivy, Saintpaulia, succulents and cacti. Mosses – spread across continents plant department, numbering more than 10 000 species! In nature, mosses grow in virtually all climatic zones, often in very extreme conditions habitat. Usually spread Moss family form dense aggregations in shady places, like humidity, so they can grow in close proximity to water. Although there are many species that thrive in the sunny dry areas, as well as a constantly low temperature. In florariumah moss it is often an additional element covering the open ground areas. But it is quite possible to make the main character of moss composition. To do this, you can either buy in flower shops moss for landscaping and decoration of indoor plants such as sphagnum moss, and dig up some kinds of moss in the forest. It is desirable to cut only the top part, without roots, to allow coating to recover Mokhova. Composition with moss may include other plants, but try to make sure that they do not overlap and do not distract attention from the soft velvety coating. Moss survives well in acidic soil, so you can buy in the store a special substrate for moss, which can be put on top of the normal soil. With moss well florariumy obtained with the landscape of the forest temperate climate. Create the conditions of the natural habitat of moss. 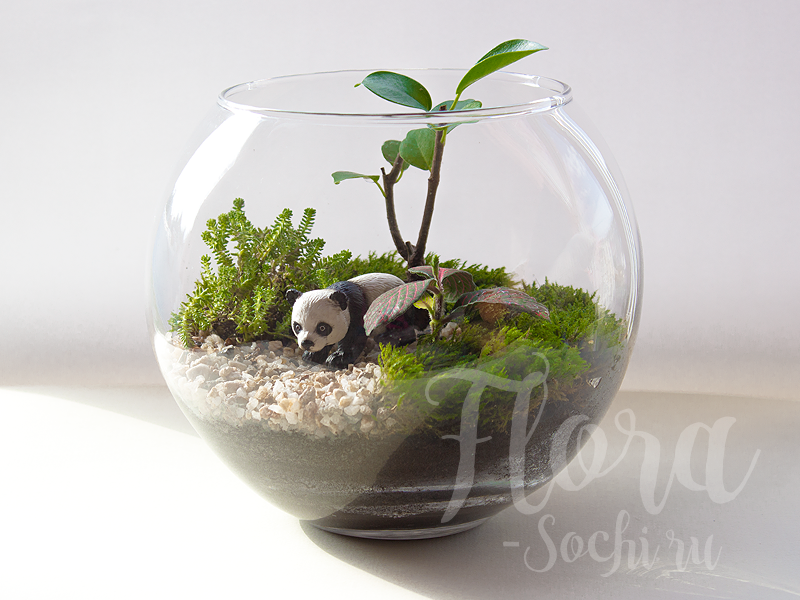 Place in a container with water florarium often spray the entire composition. 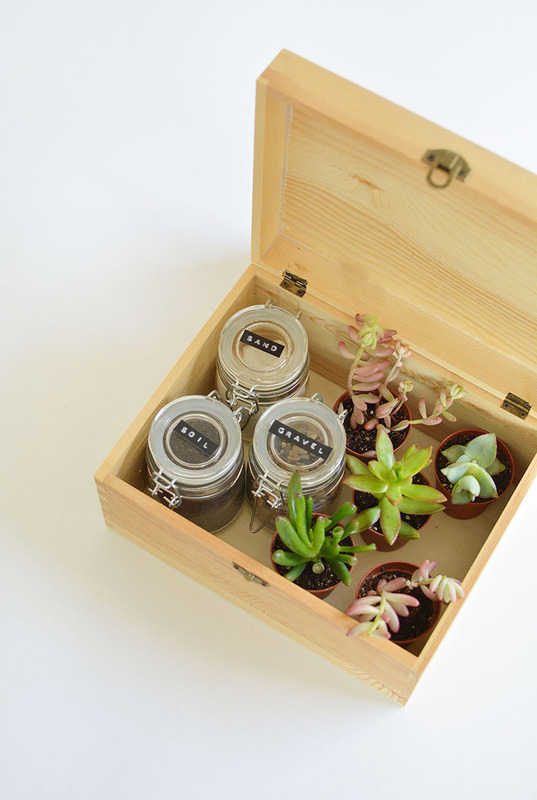 Prepare a container for planting the plants. Well her wash, pour over boiling water. Pour drainage layer 3-4 cm in height. It can be expanded clay, coarse sand, gravel, decorative stones for aquarium, and the like. Place on top of the drainage activated charcoal directly into tablets or crushed, can be used to fine charcoal. It is necessary for the absorption of harmful chemicals entering the water, to prevent mold and mildew. 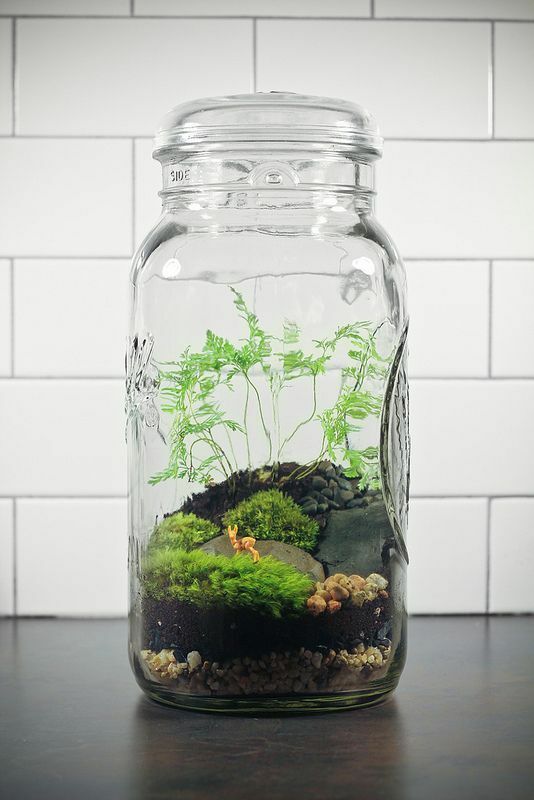 By the way, water and spray the plants in the terrarium it is recommended filtered water. Top sprinkle damp soil 5-8 cm. By the way, pulverized coal can be mixed with the soil, rather than to lay a separate layer. 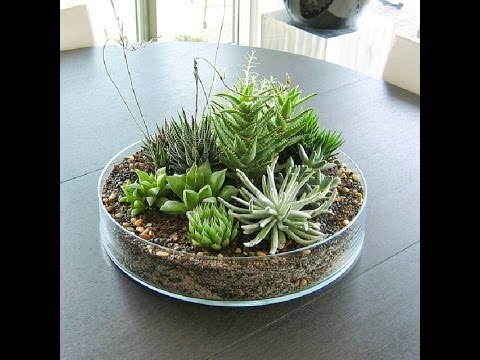 For compositions with desert plants can be used sifted sand, and tropical plants – finished substrate. 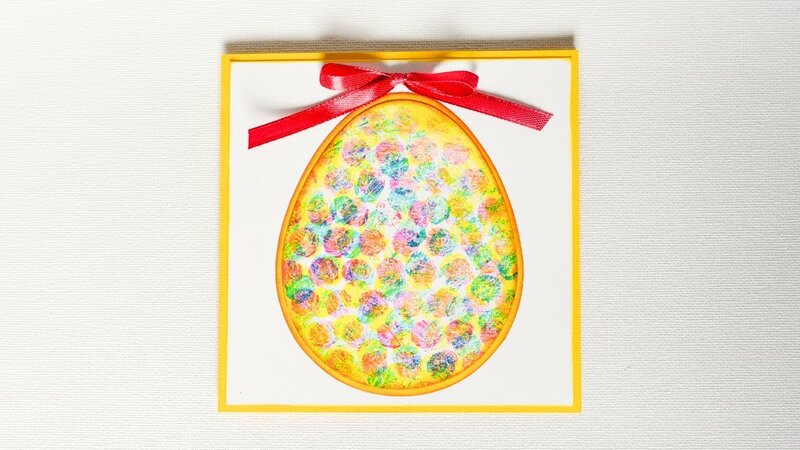 Decoration of soil layers can be alternated with thin layers of colored sand. Smooth the soil, spoon make small holes for the plants. The plants themselves pull out of the pot, clean the roots. 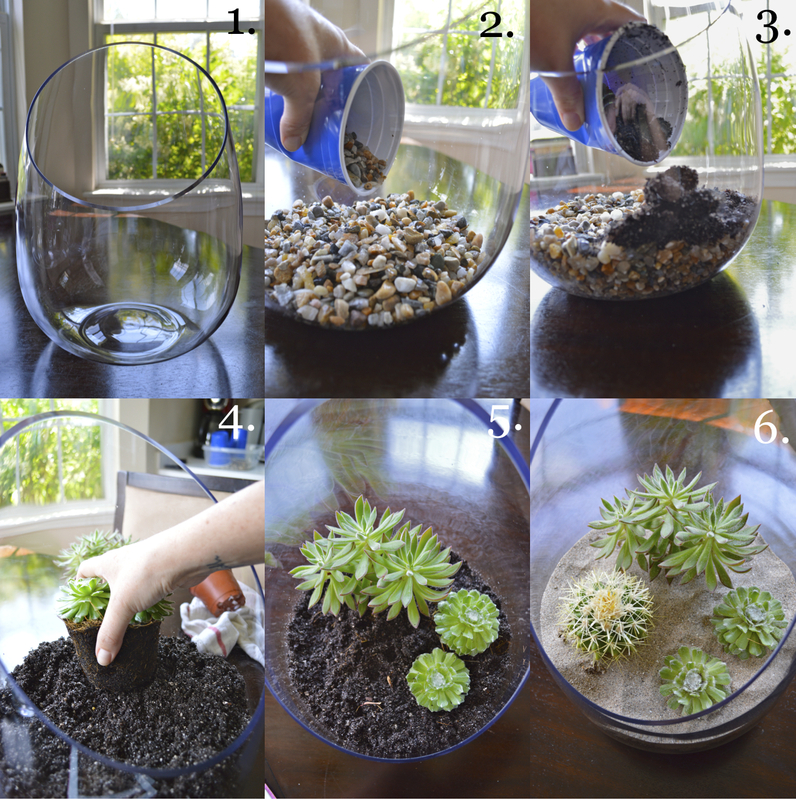 Use tweezers to gently plant the plants, sprinkle the roots with soil. 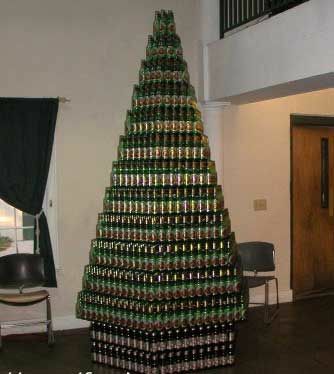 Make sure that the big leaves do not touch the walls of the container, otherwise they may constantly accumulate condensate, and they zagniyut. Planted plants gently sprinkle of the sprayer. If the soil moist enough, pour water from a watering can with a fine spout. 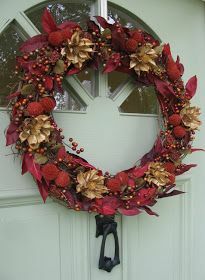 Add decorative elements. Here is a master class in how to make florarium bank. By the way, an excellent joint activity with the children!